The good old yellow Pac Man is on a holiday and is replaced by Pac Melon. This character is made out of melon and put on to a t-shirt (hoodie also available). And below this lovely ghost eater it says “pac melon” . 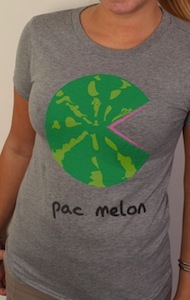 This Pac Melon t-shirt comes in a range of sizes and colors and is available in a women’s or unisex version. Come have a closer and better look at all your option of this Pac Melon T-Shirt.